These Women Just followed the Plan! and best of all I have seen results! that You Don’t Even Have to Leave Home to Do! NOURISH YOURSELF: Simplify your eating with 8 full weeks of recipes and guides. 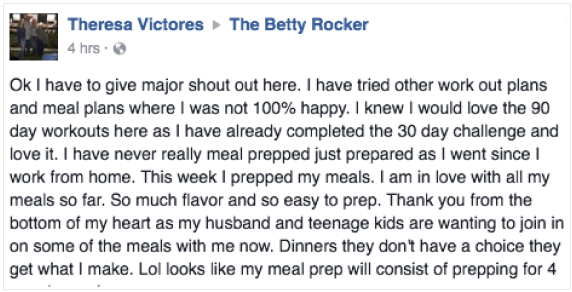 Use the delicious recipes or dive into the meal plans and follow the plan! PROGRESS: Each week, the workouts get progressively more challenging. You’ll have the complete set up to adjust and modify as needed, and progress at your own pace. EMPOWER YOURSELF: Gain confidence as you take action using this program, and enjoy more energy, better sleep and more happiness as you follow this program! TIME SAVING: These fast, effective circuits can be formatted as 16 minute or 24 minute workouts, so you can make the most of the time you have. I know you’re busy! You won’t even need to leave the house to get this done! HAVE FUN! Nothing is worse than the workout we dread doing! With the constant variety, quick format and fast pace, you’ll never be bored and you’ll be looking forward to #bettyrocking! Do this from home or take it with you on the go – you can do these workouts anytime, anywhere and it makes a great resource for traveling! Lost inches where it counted! master your form and get coached! Whether you’re a beginner, intermediate or advanced, you’ll find a workout calendar for each 30 days to help you progress and stay on track! Workout safer and more efficiently. Stay on track and stay motivated with this 3-month coaching e-course to supplement your program! The most successful challengers are the ones who stay connected and accountable, so to make sure you are one of them, I’ll be sending you activities like commitment statements, check in reminders, nutrition and fitness content and plenty of motivation to make sure you are having fun and staying on track while you go through this program! 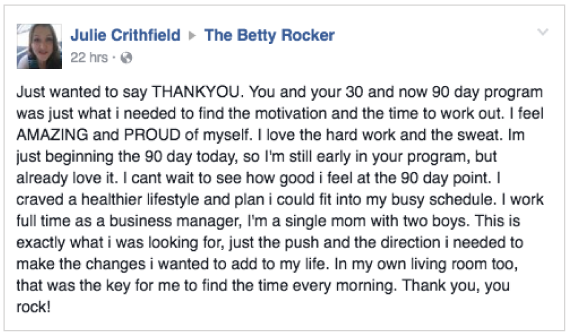 Who is Betty Rocker? 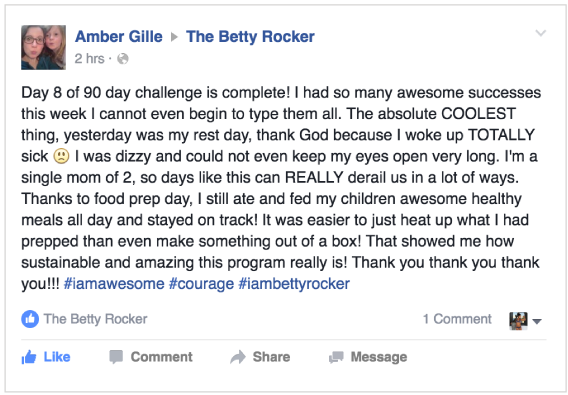 Betty Rocker is me! My name is Bree Argetsinger, but I’ve been called “punk rock Betty Crocker” since I was a little girl. 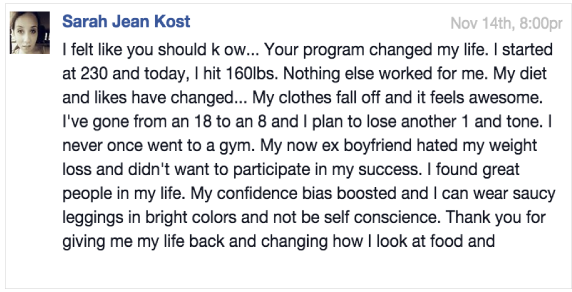 I’m a health coach and fitness motivator, and I work with people all over the world, helping them transform from the inside out. My passion for fitness and health developed after treating my body very badly for many years and choosing to educate myself and do the work to develop good practices based on science, my own intuition and a deep love and compassion for other people who were struggling as well. While working as a structural integration therapist with extreme sports athletes and racers (which I did for 8 years! 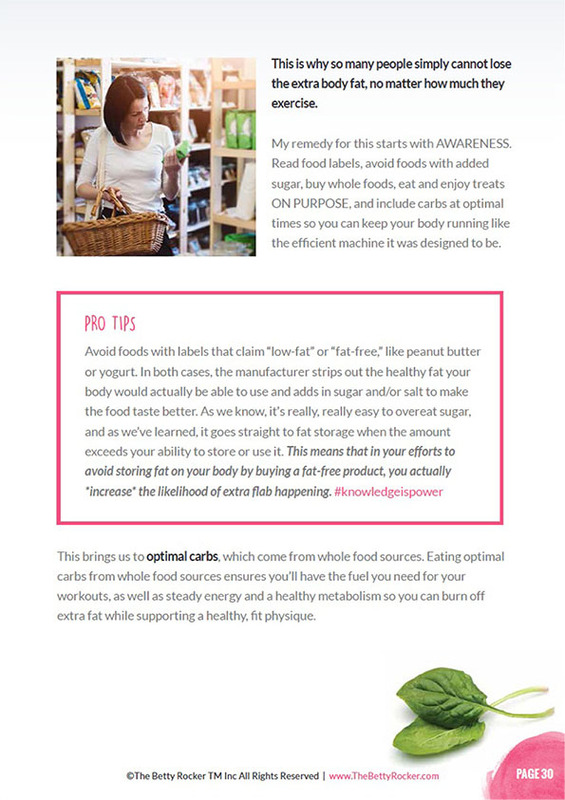 ), my clients started asking me for nutrition plans that were like “what I was using.” When I saw how much more quickly they got results following my combined nutrition and workout plans, I transitioned to the work I do now and began teaching this impactful information online so I could reach as many people as possible. I have mastered many aspects of health and personal development, including becoming a C.H.E.K. (Corrective Exercise and High-performance Kinesiology) certified Exercise Coach, an I.S.S.A. certified nutrition specialist, and a Nationally Certified Structural Integration Practitioner (realignment of the body through manual therapy). I’ve written multiple cookbooks, and nutrition and fitness plans that have been successfully used by thousands of people. My primary focus is on empowering you with the skills and knowledge you need to make the best choices for yourself – so you can achieve the result you’re looking for while enjoying yourself along the way. For security purposes, all orders are processed on a secure server. After Purchase. This Program is 100% Digital. No Physical Products will be Shipped. 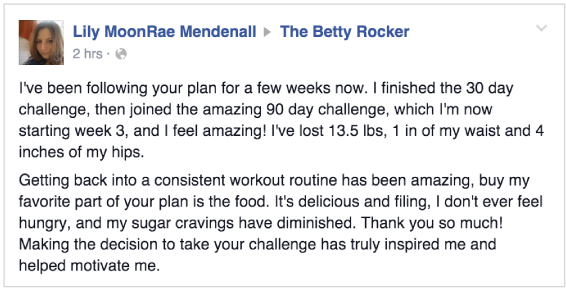 Take the first step toward improving your health by trying my 90-day challenge plan for the next 60 days. If you don’t feel healthier, more energized and simply amazing, you won’t pay. If you’re not satisfied, simply contact customer service within 60 days for a full refund. Please note that this opportunity is extremely limited because of the low price I’m offering you. Remember, you’re getting a 12-week home workout program with meal plans, workouts and guides, and saving over $100 (around 45%) off the usual price. This is a promotional launch price and will be increased without warning. 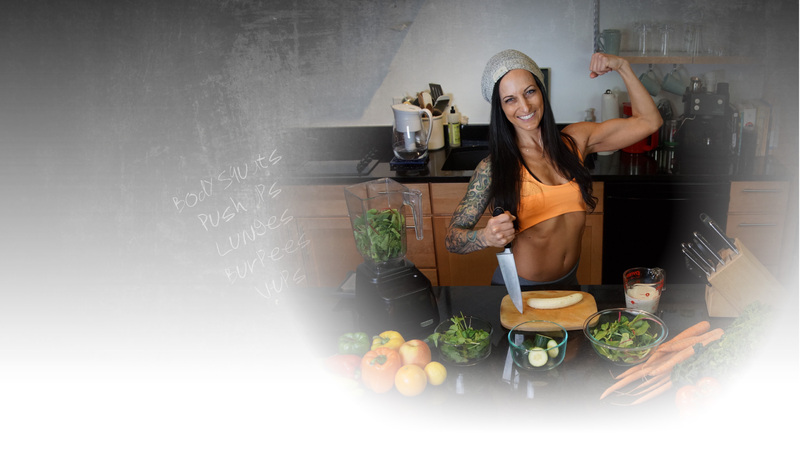 With this program, I’m giving you THE ULTIMATE BLUEPRINT to creating a healthy lifestyle and body you love, including the workouts and the meals that have helped me personally stay consistent, get in the best shape of my life on a limited time budget, and feel completely in control of my life. Best of all, it will take you very little time to start seeing and feeling the results of using this program, because you will have the guidance, the workouts and the plan to follow to take action on creating a fit body and healthier lifestyle than you have ever experienced. Got Questions? I’ve Got Answers…. 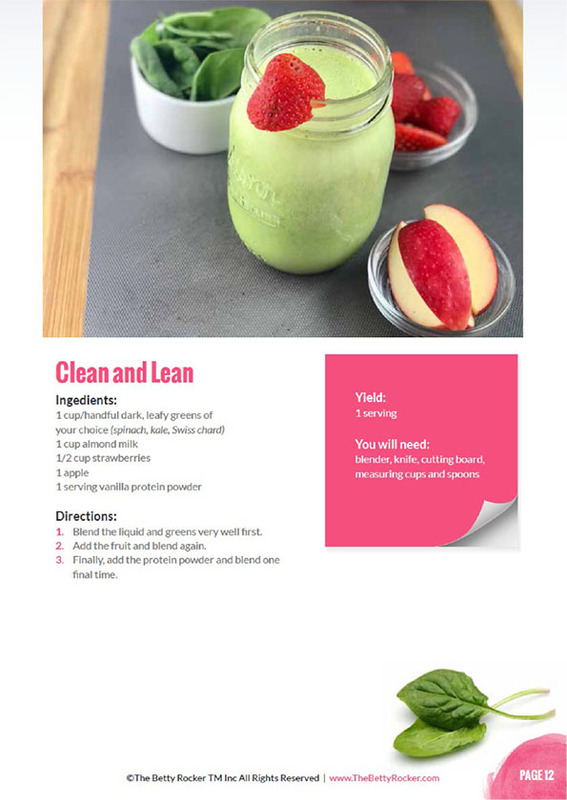 The 90-day Transformation Challenge includes 12 weeks of progressive workouts with printable workout guides, demonstration videos, as well as an 8-week meal plan with grocery lists, food prep, groceries and daily menus. You’ll have a special workout calendar for your fitness level – beginner, intermediate or advanced and can do 3-5 workouts per week, choosing your perfect time length – 8, 16 or 24 minutes. You’ll also get amazing bonus gifts, including the body alignment sequence, the yoga classes, and the ENTIRE 30-day challenge video collection, a 90 day coaching e-course and everything you see on this page! How are the Workouts Formatted? These workouts are done circuit style, for time. You’ll be able to do shorter or longer-duration rounds of the workouts depending on your fitness level. Each week, the workouts build in complexity, increasing your strength and endurance. I'm already following a program, can I do the 90 Day Challenge too? Yes, absolutely! As long as you are taking rest days you can use the challenge workouts to maximize the effectiveness of any other program you are on. 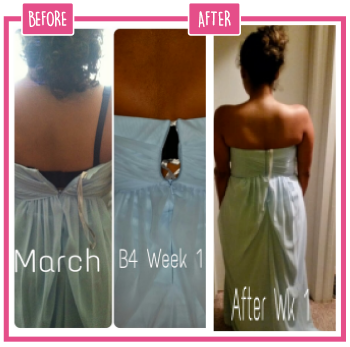 The program is a standalone program and can be done very effectively by itself. 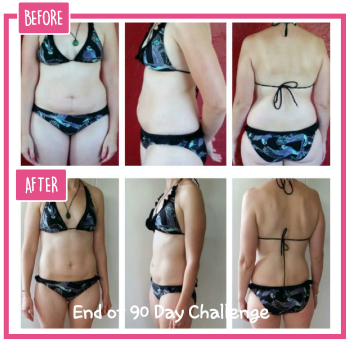 But if you’re already doing other activities like running, weight training and other sports, it’s very easy to incorporate that into the 90 day challenge Program. Is the program ok if I'm a beginner? What about if I'm super advanced? The program is progressive, allowing you to develop strength in key muscles and build over the entire 12 weeks. I will also provided you with different workout calendars for everyone from beginners to advanced for each of the 12 weeks – so you can dial it down or up. I am a pretty advanced exerciser, can make week 1 into a challenging workout. With a simple adjustment format, you’ll be able to start where YOU are at. Do I need ANY equipment? What about special shoes? You don’t need any equipment – you may want a mat or towel to do some of the laying down moves, but you don’t need any weights or machines or even a specific location. In some of the weeks, we may show you a move where you can hold water bottles to add resistance, but that’s optional. All you need is enough floor space to make it happen! You can perform the workouts barefoot or with sneakers. I wear a very minimal shoe or go barefoot. The important thing is to have a giving or springy surface when you’re jumping. A mat comes in handy if you have a hard surface as it will help to cushion the impact. How long do the workouts take? I'm really short on time. If you have less than 10 minutes, you can do one round of your workout (about 8 minutes) with intensity and experience benefits for hours afterwards. If you have more time, you can do 2 rounds, or 3 rounds – and follow the prescribed amount for your fitness level. However, even if you do just one round on a day you are really busy, you will be getting benefit from the workout and staying on track! 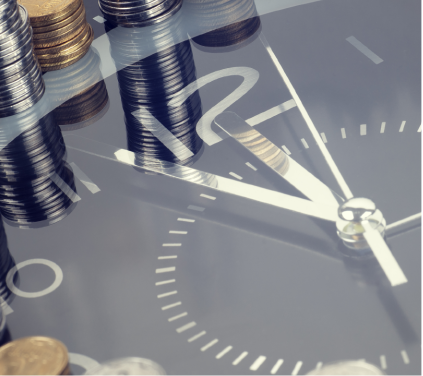 Having this flexible format will ensure you stay consistent and see real progress with a very small time commitment – even in just 3 times a week! Do I have to follow the meal plans? How flexible are they? The meal plans are super flexible! 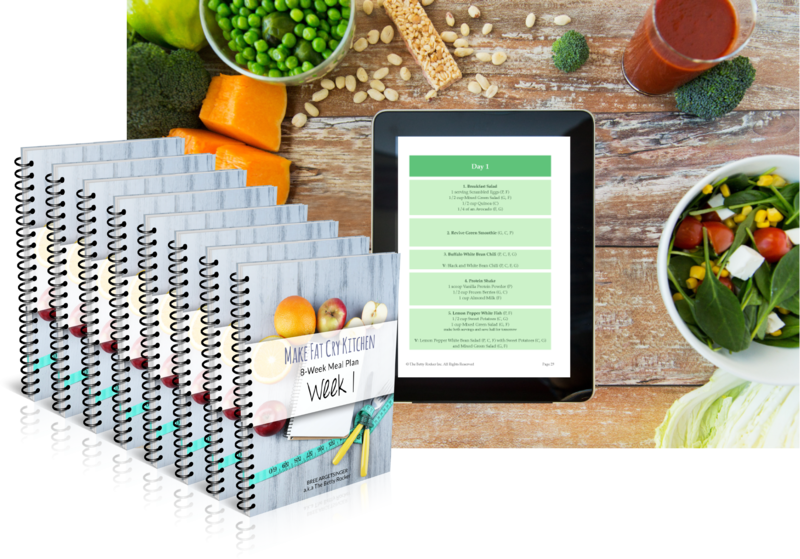 You can choose to follow the weekly guide and do the food prep and grocery shop as it’s laid out, or simply try some of the delicious recipes and incorporate them into your current eating to start to improve your energy and results. The recipes are all gluten and dairy free, include vegetarian options and are made with whole foods. 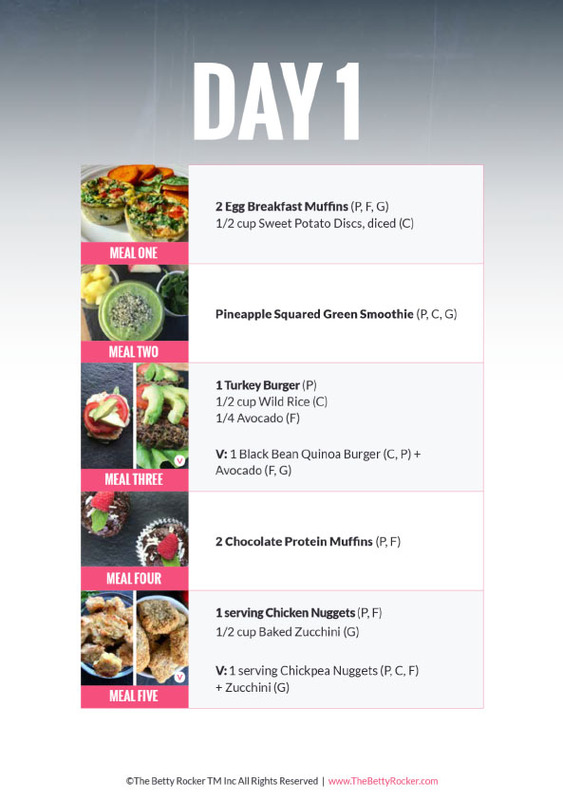 What kind of foods can I expect to eat if I follow the meal plans? 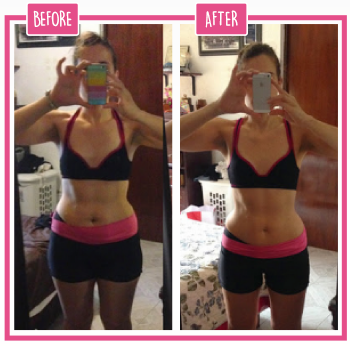 The meals and recipes are all based on whole, natural foods that are easy to put together. 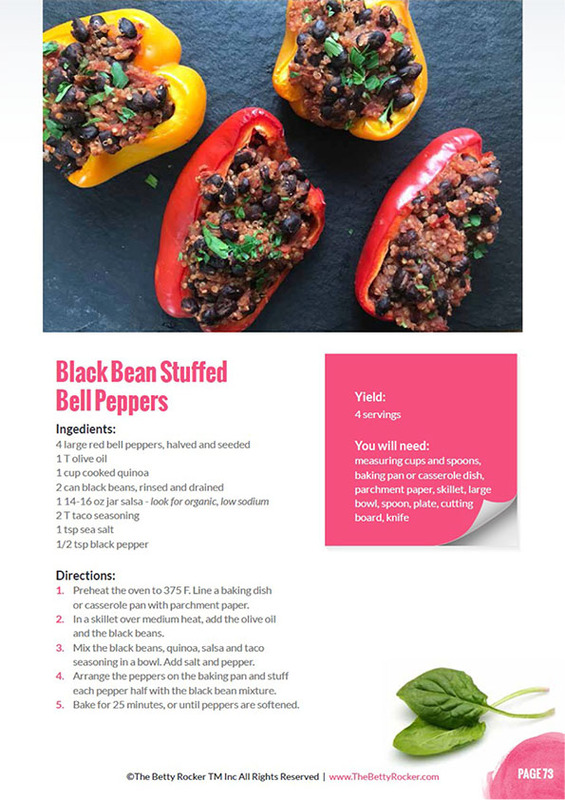 Plus, for every recipe with meat or fish, there is an alternative option suitable for vegetarians or pescatarians, or anyone who chooses to use them. 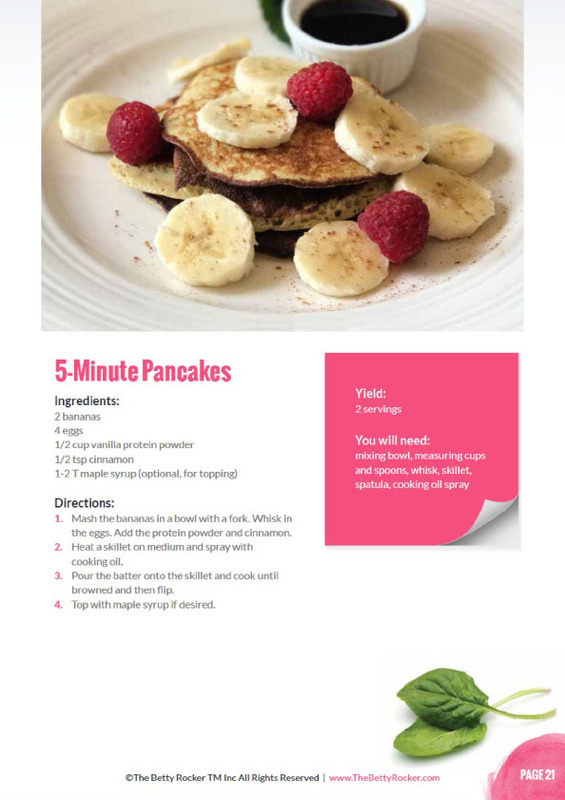 The food in this program is gluten free, dairy free and soy free (several of the meat-alternative recipes contain soy. If you are following the regular program, there is no soy). How soon will I get my program and videos? Right away! As soon as you enter your billing information, you’ll receive an email with a secure login and password so you can instantly access your brand new program from ANY device in an exclusive member’s area. You’ll have forever access to this once you have purchased it! Can I take these workouts with me if I travel? Yes you can! They are ideal for travelers, as you can do them in small spaces in a short amount of time. The workouts are portable (you can access them on any device) and conveniently available anytime, anywhere! Can I stop and Start the Program? Can I do it more than once? Yes you can! Many people use it in 30 day blocks after they have gone through it the first time. It’s such a great resource to have that you can come back to it again and again. Having access to an entire library of workouts to do anywhere is an amazing game-changing tool that will help you stay consistent with your fitness! I’ve got you covered! Myself and my friendly team is available to answer your questions 7 days a week, 9-5 PST! Simply shoot us an email anytime at support@thebettyrocker.com or reply to one of the emails you’ll be getting in your coaching e-course and we’ll be delighted to help you! The web sites www.thebettyrocker.com and www.makefatcrychallenge.com, all of the various pages contained therein, including subdomains (for example members.thebettyrocker.com, or shop.thebettyrocker.com), as well as your use of the products and services offered therein are maintained and operated by Betty Rocker, which is defined below. Feel free to print a copy of these Terms for future reference. We may from time to time amend these Terms. 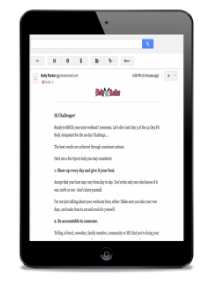 Those changes will be posted here and may also be communicated to you by any written contact method we have with you. However, these changes take effect on the date posted on our Site. These Terms are a legal agreement between you and us and contain important information regarding your legal rights, remedies and obligations. By accessing, browsing or otherwise using the Site, you: (i) acknowledge you have read, understand, and agree to be bound by these Terms; (ii) agree to comply with all applicable laws, rules and regulations with respect to your use of the Site; and (iii) represent you are an adult and have the legal capacity to enter into contracts in the jurisdiction where you reside. IF YOU DO NOT AGREE TO THESE TERMS, YOU MAY NOT ACCESS, BROWSE OR USE OUR SITE, AND SHOULD DISCONTINUE YOUR ACTIVITIES IMMEDIATELY. “Betty Rocker,” the “Company,” “we,” “us,” or “our” includes The Betty Rocker, Inc., and its trustees, officers, directors, shareholders, employees, attorneys and agents (current and past) and any related individuals or entities. Service or Services means any of the Site or other products or services provided or offered by us, including those described in these Terms, whether through a website owned, maintained or controlled by us, through a social network, a mobile application, on a cellular telephone or otherwise. Content means all the content and materials that appear on the Site. Lifetime: To the extent that you are “A Lifetime” customer or been afforded “lifetime access,” you are entitled to use a program for so long as the program is made available by Betty Rocker. We require an individual to be at least eighteen (18) years old to be a user on our Site. This Site is not directed toward children under 13 years of age, nor do we knowingly collect information about children under 13. If you are under 13 years of age, you are not permitted to submit personal information to us. If we find out you are under 13 years of age, we will immediately, upon notice, cancel your account and delete all of your Content. If a parent becomes aware any of his/her children has submitted any personally identifying information (“PII”) to us, please immediately notify us at support@thebettyrocker.com or at The Betty Rocker, Inc. 113 West G St #713, San Diego, CA 92101. 4. You Understand And Agree That Physical Exercise Is Strenuous. This Site is intended for use only by healthy adult individuals. The Site is not intended for use by minors, pregnant women, or individuals with any type of health condition. Such individuals are specifically warned to seek professional medical advice prior to initiating any form of weight loss effort or regimen. If you use this Site, you understand that physical exercise can be strenuous and can expose you to the risk of serious injury. As with all programs, techniques and materials related to health, exercise and fitness, we urge you to obtain a physical examination from a doctor before participating in any exercise activity. You acknowledge that your use of our Site may present certain risks, and hereby assume any and all risks associated therewith, including, without limitation, the risk of physical or mental or emotional injury, minor and/or severe bodily harm, death, and/or illness, which arise by any means, including, without limitation: acts, omissions, recommendations or advice given by us. By using our Site, you hereby agree to voluntarily accept and assume any and all such risks as well as any risks not mentioned herein that are in any way associated with your use of our Site. You agree that by participating in physical exercise or training activities you do so entirely at your own risk. This site offers health, wellness, fitness, exercise and nutritional information and is designed for educational purposes only. 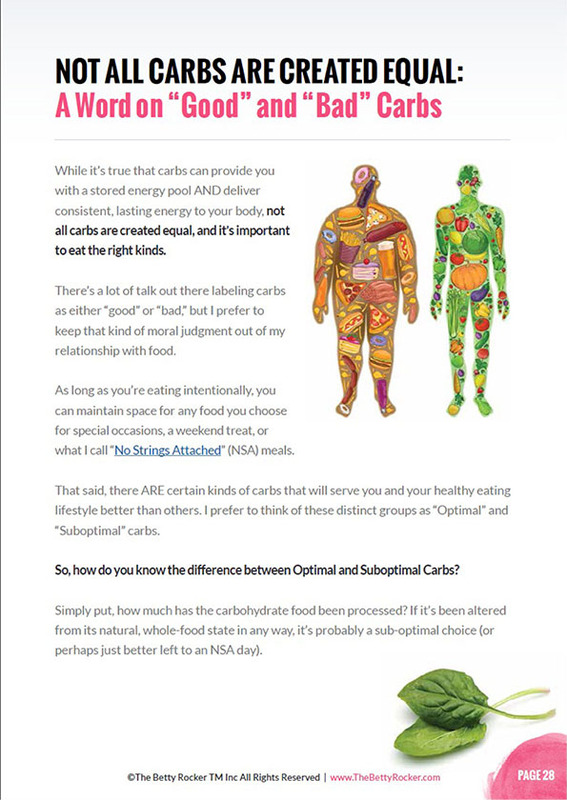 The nutritional, exercise, and other information on this Site is not intended to be and does not constitute health care or medical advice and must not be used to make any diagnosis specific to you. We do not employ dietitians or any other health care professionals. You should not rely on this information as a substitute for, nor does it replace, professional medical advice, diagnosis or treatment. If you have any concerns or questions about your health, you should always consult with a physician or other health-care professional. Do not disregard, avoid, or delay obtaining medical or health-related advice from a health-care professional because of something you may have read on this site. This Site makes no warranty of any kind, implied or express, that you will lose weight, build muscle, or otherwise receive any health benefits as a result of using our Site. Individual results will vary. 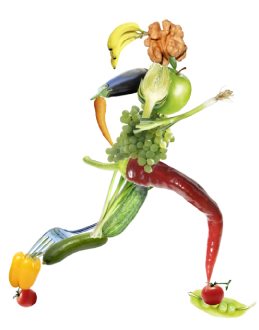 Moreover, because fitness and nutritional research is always ongoing and developing and subject to disagreement in the field, we cannot make any assurances that the information provided in our Site will be up-to-date, accurate, or complete. Your use of any information contained on this Site is solely at your own risk. You may access, browse and use the Site and its content only for limited purposes. Your use is limited to your personal, non-commercial use of the Site. If you are posting content on our Site, or submitting any material (including, without limitation, comments, blog entries, Facebook postings, photos and videos) to us via the Site, internet groups, social media venues, or to any of our staff via email, text or otherwise, you are representing: (i) that you are the owner of the material, or are making your posting or submission with the express consent of the owner of the material; and (ii) that you are thirteen years of age or older. In addition, when you submit, email, text or deliver or post any material, including photographs you are granting us, and anyone authorized by us, a royalty-free, perpetual, irrevocable, non-exclusive, unrestricted, worldwide license to use, copy, modify, transmit, sell, exploit, create derivative works from, distribute, and/or publicly perform or display such material, in whole or in part, in any manner or medium, now known or hereafter developed, for any purpose. The foregoing grant shall include the right to exploit any proprietary rights in such posting or submission, including, but not limited to, rights under copyright, trademark, service mark or patent laws under any relevant jurisdiction. Also, in connection with the exercise of such rights, you grant us, and anyone authorized by us, the right to identify you as the author of any of your postings or submissions by name, email address or screen name, as we deem appropriate. You acknowledge and agree that any contributions originally created by you for us, including social media posts, shall be deemed a “work made for hire” when the work performed is within the scope of the definition of a work made for hire in Section 101 of the United States Copyright Law, as amended. As such, the copyrights in those works shall belong to Company from their creation. Thus, Company shall be deemed the author and exclusive owner thereof and shall have the right to exploit any or all of the results and proceeds in any and all media, now known or hereafter devised, throughout the universe, in perpetuity, in all languages, as Company determines. In the event that any of the results and proceeds of your submissions hereunder are not deemed a “work made for hire” under Section 101 of the Copyright Act, as amended, you hereby, without additional compensation, irrevocably assign, convey and transfer to Company all proprietary rights, including without limitation, all copyrights and trademarks throughout the universe, in perpetuity in every medium, whether now known or hereafter devised, to such material and any and all right, title and interest in and to all such proprietary rights in every medium, whether now known or hereafter devised, throughout the universe, in perpetuity. Any posted material which are reproductions of prior works by you shall be co-owned by us. You may access portions of the Site without purchasing anything or creating an account. There is, however, Content on this Site which is available only if you create an account or make a purchase. When any of the Services on the Site require you to open an account or otherwise provide user or registration information, including user name and password (“User Information”), you must complete the registration process by providing us with complete, truthful and accurate information. You are responsible for maintaining the confidentiality of your username, password and other information used to register and sign in to the Site, and you are fully responsible for all activities that occur under this password and username. Please immediately notify us of any unauthorized use of your account or any other breach of security by contacting us at support@thebettyrocker.com or at The Betty Rocker, Inc. 113 West G St #713, San Diego, CA 92101. In the event you use the Site over any cellular/mobile devices, you hereby acknowledge that your carrier’s normal rates and fees, such as excess broadband fees, will still apply. We cannot and will not be liable for any loss or damage arising from your failure to protect your password or account information. When using the Site, you shall be subject to all displayed rules and policies. Such rules and policies are hereby incorporated by reference into these Terms. We may also offer other content and/or services that are governed by different Terms. Betty Rocker is the exclusive owner or licensee of all the Content, and of all related intellectual property rights therein, including, but not limited to, all copyrights, moral rights, trademark and patent rights (the “IP”). Our Content includes, but is not limited to, all features, functions, services, software, algorithms, designs, objects, documentation, know-how, code, data, art, graphics, animation, photographs, images, text, music, sound effects, audio and/or audio-visual elements, downloadable materials, look-and-feel, design, layout, organization, presentation, user interface, navigation and stylistic convention of the Site. All trademarks, trade names, copyrights, logos and service-marks, whether or not registered (collectively, the “Marks”) relating to or constituting our IP are our exclusive property. The Site and our Services and Content are protected by copyright, trademark, and other laws of the United States and other countries. Unauthorized use of any of the Marks is strictly prohibited by law. All third-party trade names, trademarks, logos and service marks, if any, that appear in or on the Site are the property of their respective owners. You do not acquire any ownership interest in the IP or the Marks by accessing, browsing or otherwise using the Site. You may not reproduce, copy, modify, distribute, transmit, display, perform, publish or otherwise exploit, through any means or media, any of our IP or Marks. This Site and all the materials available on the Site are the property of us and/or our affiliates or licensors, and are protected by copyright, trademark, and other intellectual property laws. The Site is provided solely for your personal noncommercial use. You may not use the Site or the materials available on the Site in a manner that constitutes an infringement of our rights or that has not been authorized by us. More specifically, unless explicitly authorized in these Terms of Service or by the owner of the materials, you may not modify, copy, reproduce, republish, upload, post, transmit, translate, sell, create derivative works, exploit, or distribute in any manner or medium (including by email or other electronic means) any material from the Site. You may, however, from time to time, download and/or print one copy of individual pages of the Site for your personal, non-commercial use, provided that you keep intact all copyright and other proprietary notices. We may prevent unauthorized use of the Site via technological means. You agree not to circumvent or attempt to circumvent these means. You agree that any attempted or actual circumvention, or otherwise unauthorized use, by you or anyone on your behalf will result, at minimum, in the termination of all your rights to our products and Services under these Terms. The Site may contain bulletin board services, chat areas, news groups, forums, communities, personal web pages, calendars, and/or other message or communication facilities designed to enable you to communicate with the public at large or with a group (collectively, “Communication Services”). You agree to use the Communication Services only to post, send and receive messages and material that are proper and related to the particular Communication Service. Further, you agree that Your Use of the Site is solely for private and personal purposes. You further warrant and represent that you will not engage in any of the activities that expose you to civil and/or criminal liability. Some of the Content on our Site can only be viewed if you purchase it or pay for a meal plan or workout program. The details of these products and programs are available in various areas of the Site and allow you to purchase products, features or services. You agree to pay all fees and applicable taxes incurred by you or anyone using your Account. Unless otherwise noted, all currency references are in U.S. dollars. All fees and charges are payable in accordance with payment terms in effect at the time the fee or the charge becomes payable. If there is a dispute regarding payment of fees to, or products or Services provided by us, your Account may be closed without warning or notice at our sole discretion. We may, from time to time, modify, amend, or supplement our fees and fee-billing methods, and such changes shall be effective immediately upon posting on the pricing page, in these Terms, or elsewhere on the Site. Please refer to the refund policy that is provided with the plan, program, or content that you have purchased. You understand and agree that we are only obligated to refund you as stated in the applicable refund policy. Cancellation of Recurring Charges: If you purchase a program that has recurring monthly charges, you may cancel future billing and terminate your program participation by contacting us at support@thebettyrocker.com. Your request will be effective for the next billing cycle. The Site may contain links to websites of third parties. If you click these links, you will leave our Site. You expressly release us from any and all liability arising from your use of any third-party website, service or content. You specifically agree that we are not responsible for any loss or damage of any sort resulting or arising from your dealings with those third-party websites and/or their providers. 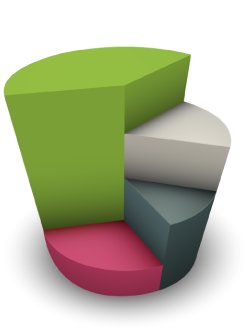 The payments for our Services are processed by a third party, using the third party’s secure software. That third party is responsible for the processing of credit card payments and the storage of credit card information for the Site. You expressly release us from any and all liability arising from the credit card processor’s processing and storage of your credit card information. We administer, control and operate the Site from the County of San Diego, State of California, United States of America. The Site is accessible worldwide. However, some of its features or functions may not be available or appropriate for use outside of the United States and/or may not be available to all persons or in all geographic locations. We make no representation that the Site or our Content and/or Services are appropriate or authorized for use in all countries, states, provinces, counties, localities or any other jurisdictions. Your access and use of the Site may not be legal in your jurisdiction. If you choose to access, browse or use the Site, you do so on your own initiative and at your own risk, and you are responsible for compliance with all applicable laws if, and to the full extent that, such laws and restrictions are applicable. We reserve the right to limit, in our sole discretion, the provision of any feature or function of the Site to any person and/or geographic area. Any offer for any feature or function made on the Site is void where prohibited. AS A USER, YOU ACKNOWLEDGE AND AGREE THAT YOUR SOLE REMEDY FOR ANY PROBLEMS OR DISSATISFACTION WITH THE SITE IS TO TERMINATE YOUR ACCOUNT AND DISCONTINUE ALL USE OF THE SITE. THUS, EXCEPT AS SET OUT BELOW, UNDER NO CIRCUMSTANCES, INCLUDING ANY BREACH OF CONTRACT, TORT, NEGLIGENCE, STRICT LIABILITY OR ARISING UNDER ANY OTHER LEGAL OR EQUITABLE THEORY WILL BETTY ROCKER, ITS SUBSIDIARY OR PARENT COMPANIES OR AFFILIATES, BE LIABLE FOR ANY DIRECT, INDIRECT, SPECIAL, EXEMPLARY, PUNITIVE, INCIDENTAL OR CONSEQUENTIAL DAMAGES THAT ARISE OUT OF OR IN CONNECTION WITH THE USE OF OR INABILITY TO USE THE SITE (INCLUDING WITHOUT LIMITATION USE OF OR RELIANCE ON INFORMATION AVAILABLE ON OR IN THE SITE OR OTHERWISE RELIED ON OR USED BY US IN DELIVERING THE SITE, AND/OR ANY INTERRUPTIONS, ERRORS, DEFECTS, MISTAKES, OMISSIONS, DELETIONS OF FILES, DELAYS IN OPERATION OR TRANSMISSION, NONDELIVERY OF INFORMATION, DISCLOSURE OF COMMUNICATIONS, AND/OR ANY OTHER FAILURE OF PERFORMANCE), OR FOR ANY CONTENT, INFORMATION, SOFTWARE, PRODUCTS OR SERVICES OBTAINED OR ACCESSED THROUGH THE SITE, EVEN IF ADVISED OF THE POSSIBILITY OF SUCH DAMAGES. IN NO EVENT SHALL THE TOTAL LIABILITY OF BETTY ROCKER TO YOU FOR ALL DAMAGES, LOSSES AND CAUSES OF ACTION EXCEED, IN THE AGGREGATE, THE AMOUNT PAID BY YOU TO US FOR YOUR USE OF THE SITE DURING THE THREE (3) MONTHS IMMEDIATELY PRECEDING YOUR CLAIM. Some states or jurisdictions do not allow the exclusion or limitation of consequential or incidental damages and, in such states or jurisdictions, our liability shall be limited to the fullest extent permitted by law. If any particular type of damage cannot be waived or disclaimed under the law, then the remainder of the disclaimer will remain valid and continue to disclaim every other form of damage that may be disclaimed under the law. If you believe that your rights, or the rights of a third party, are being violated in any way by any content accessible on or through the Site, including copyrights, please contact us at support@thebettyrocker.com or at The Betty Rocker, Inc. 113 West G St #713, San Diego, CA 92101. You agree that we may assign any of our rights, and/or transfer, sub-contract or delegate any of our obligations, under these Terms. You may not transfer or assign your rights and obligations under these Terms to any third party without our prior written consent. We reserve the right to modify these Terms and/or any other guidelines or policies affecting the Site at any time, and such revisions will become effective upon the earlier of (i) posting of the revisions to the Site, or (ii) distribution of the revisions by electronic mail. For this reason, please visit this page on a regular basis and check the “Last Updated” date at the top of these Terms to ensure you are familiar with the most recent version of these Terms. Your continued use of the Site after the effective date of the revisions signifies your acceptance of any such revisions. You will have no claim, complaint or demand against us for applying such changes or for failures incidental to such changes. Upon termination of your access to or ability to use our Site, including but not limited to suspension of your Account, your right to use or access any Service and/or any Content will immediately cease. All provisions of this Agreement that by their nature should survive termination, shall survive termination, including, but not limited to, ownership provisions, warranty disclaimers, limitations of liability, the dispute resolution (arbitration) and class waiver provisions. Termination of your access to and use of our Site shall not relieve you of any obligations arising or accruing prior to such termination or limit any liability which you otherwise may have to us or any third party. On termination of your Account or upon your deletion of any particular Service or Content, you acknowledge and agree that: (a) caching of, copies of, or references to the Content may not be immediately removed; and (b) such removed Content may persist in backups (not available to others) for reasonable periods of time. You agree to release and indemnify us from all claims related to the retention of deleted Content. You hereby agree that we shall have the sole right and obligation to control the legal defense against any such claims, demands, or litigation, including the right to select counsel of our choice and to compromise or settle any such claims, demands, or litigation. You further waive any and all benefits and rights that would otherwise accrue to you by reason of the provisions of any federal or state statute or principle of common law of any state of the United States, or any political entity or nation, province or local law or regulation that may govern this release, which statute, regulation, law or principle provides in substance something similar to California Civil Code § 1542. You agree not to file any action or lawsuit inconsistent with the foregoing release. You agree the laws of the United States of America and, more specifically, the laws of the State of California, without regard to any principles of conflicts of laws, will govern these Terms, your use of the Site, and all matters relating to your access to, and/or use of, the Site, including all disputes between you and us. You also agree that: (i) the Site shall be deemed solely based in California; and (ii) the Site shall be a passive site that does not give rise to personal jurisdiction over us, either specific or general, in any jurisdiction other California. You and we waive our respective rights, if any, to bring any claim that is subject to this arbitration provision as a class action or otherwise on a representative basis. In the event this provision is held unenforceable and the matter is permitted to proceed in Arbitration as a class or representative action, then the entirety of this arbitration agreement (including all subparts) shall be void and of no further effect, and either party may proceed to pursue the action in court. Notwithstanding the foregoing binding arbitration procedure, either party may bring an individual action in small claims court (provided the claim otherwise qualifies for such a program) as an alternative to proceeding with arbitration. You may elect to opt out (exclude yourself) from the final, binding arbitration procedure and the class action waiver specified in these Terms by doing the following: Within 15 days of your first accessing the Site, you must send a letter to us at: The Betty Rocker, Inc., 113 West G St #713, San Diego, CA 92101, specifying (1) your name, (2) your IP address(es), (3) your email address, (4) your mailing address, and (5) your request to be excluded from the final, binding arbitration provision and class action waiver specified in these Terms. You are not required to send the letter by certified mail, return receipt requested or overnight courier, but it is recommended that you do so. 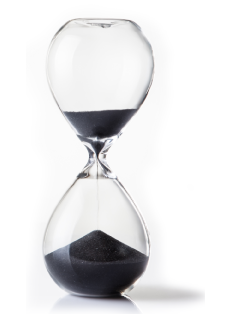 Your request to be excluded will only be effective and enforceable if you can prove the request was postmarked within the applicable 15-day deadline. If any court of competent jurisdiction finds these arbitration and/or class action waiver provisions invalid or inapplicable, you agree to the exclusive jurisdiction of the federal and state courts located in San Diego, California, and the related appellate courts, in any related action or proceeding. Further, you irrevocably submit to the exclusive jurisdiction of, and venue in, the state and federal courts in San Diego, California, and the related appellate courts, in any related action or proceeding and agree shall to not raise any claims as to San Diego, California being an inconvenient forum. Under California Civil Code Section 1789.3, users of the Site from California are entitled to the following specific consumer rights notice: The Complaint Assistance Unit of the Division of Consumer Services of the California Department of Consumer Affairs may be contacted in writing at 400 R Street, Suite 1080, Sacramento, California 95814, or by telephone at (916) 445-1254 or (800) 952-5210. The following sections shall not apply to users of the Website from New Jersey: Disclaimers/No Warranties, Limitation of Liability and Jurisdiction. Our failure to enforce any rights or provisions of these Terms shall not be deemed a waiver or relinquishment of such rights or provisions. Any waiver of any right or provision of these Terms must be in writing. If any part of these Terms is determined to be invalid or unenforceable under applicable law, including the warranty disclaimers and liability limitations stated elsewhere herein, then the invalid or unenforceable provision(s) will be deemed superseded by a valid, enforceable provision that most closely matches the intent of the original provision, and the remainder of these Terms shall continue in full effect. These Terms constitute the entire agreement between you and us and supersede all prior or contemporaneous communications and proposals, whether electronic, oral or written, between you and us, with respect to your use of the Site and all matters relating to your access to, and/or use of, the Site, our Services and our Content. Except as otherwise expressly provided in these Terms, there shall be no third party beneficiaries to this agreement. We may terminate these Terms for any or no reason at any time by notifying you through a notice on the Site or by any other method of communication provided elsewhere herein. Any such termination will be without prejudice to our rights, remedies, claims, or defenses hereunder. “Include,” “Includes,” “Including,” “include,” “includes,” and “including” herein mean including without limitation. You may contact us concerning any question about the Site or these Terms at support@thebettyrocker.com or at The Betty Rocker, Inc. 113 West G St #713, San Diego, CA 92101. The GDPR became effective on May 25, 2018, and is intended to protect the data of European Union (EU) citizens. This privacy notice discloses the privacy practices for www.workouts.thebettyrocker.com. We are the sole owners of the information collected on this site. We only have access to/collect information that you voluntarily give us via e-mail or other direct contact from you. We are a spam free site. All information is provided “as is”, without any representations or warranties of any kind, and workouts.thebettyrocker.com and The Betty Rocker, Inc. expressly disclaim all express and implied warranties including those with respect to accuracy, completeness, timeliness or fitness for a particular purpose of the information on this website or of any product or service referenced on this website, unless otherwise expressly indicated. www.workouts.thebettyrocker.com and The Betty Rocker, Inc. assume no responsibility for any losses, damages, whether direct, indirect, special or consequential, which arise out of the use or misuse of this website howsoever caused, whether such damages arise in contract, tort, negligence, equity, statute or by way of any other legal theory regardless of whether such damages could have been foreseen. The information on this website is subject to change without notice. As with all programs, techniques and materials related to health, exercise and fitness, www.workouts.thebettyrocker.com and The Betty Rocker, Inc. strongly recommend that you not rely upon or follow the programs, techniques or use any of the products and services made available by or through the use of this website for decision making without obtaining the advice of a physician or other health care professional. The information, products and services made available by or through the use of this website are provided for use by persons who have satisfied themselves as to the appropriateness of its use for themselves after obtaining the advise of a physician or other health care professional. 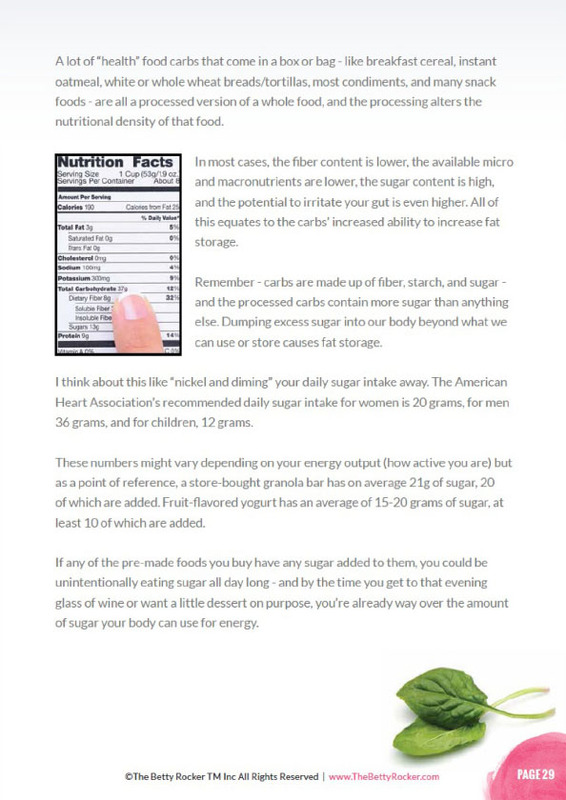 The nutritional and other information on this website is not intended to be and does not constitute health care or medical advice and must not be used to make any diagnosis specific to the online user. www.workouts.thebettyrocker.com and The Betty Rocker, Inc. do not employ dietitians or any other health care professionals. 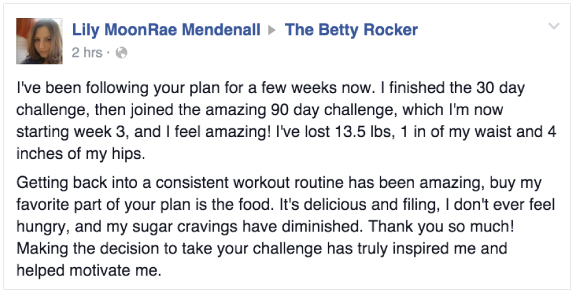 If you have chosen not to obtain a physician’s permission prior to beginning this program with www.workouts.thebettyrocker.com and The Betty Rocker, Inc. then you are doing so at your own risk. By your use of this website you acknowledge that you do hereby waive, release and forever discharge www.workouts.thebettyrocker.com and The Betty Rocker, Inc. and their respective heirs, directors, officers, agents, employees, representatives, successors and assigns, administrators, executors, and all others from any and all responsibilities or liability from injuries or damages resulting from or connected with your participation in any of www.workouts.thebettyrocker.com and The Betty Rocker, Inc. exercise programs (including any newsletters) whether arising from the negligence of www.workouts.thebettyrocker.com and The Betty Rocker, Inc., its employees, heirs, directors, officers, agents, employees, representatives, successors and assigns, administrators, executors, and other parties involved in the creation, production or delivery of the site, or otherwise. Independent parties develop websites that may be accessed from this website. www.workouts.thebettyrocker.com and The Betty Rocker, Inc. is not responsible for the privacy policies or the accuracy of the information in such websites nor do we endorse products offered in those websites. www.workouts.thebettyrocker.com and The Betty Rocker, Inc. do not represent or warrant that unauthorized use of information from this or other websites does not infringe on the trademark rights of third parties. At workouts.thebettyrocker.com and The Betty Rocker, Inc. , we take the issue of privacy seriously. We want to assure you that the security and confidentiality of personal information that you disclose while visiting our website will be respected. Policies governing the protection of privacy on our website are strictly observed and enforced to ensure this happens. 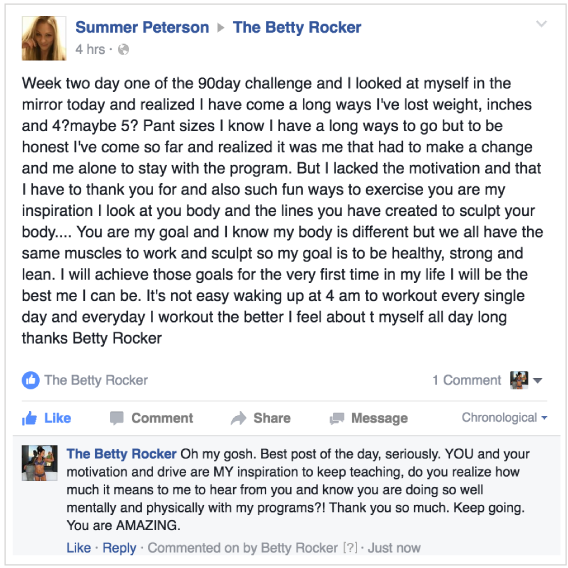 In our online access area, you may be asked to provide personal information that is necessary for us to communicate with you, to provide you with your training program and any other information that workouts.thebettyrocker.com and The Betty Rocker, Inc. consider may be valuable to you. Personal financial information is required to enable us to bill you for products and/or services you have requested. It is your responsibility to ensure that the information provided by you is complete and accurate. We use the information collected from you when you visit our website to address your specific requests and to provide better customer service, including the provision of the latest information regarding our products and services. The information collected may also be used to document communications between workouts.thebettyrocker.com and The Betty Rocker, Inc. and our online users and to comply with any applicable legal and/or regulatory requirements. Certain employees will be provided with information about a website visitor in order to fulfill that user’s requests and provide the user with requested information regarding specific products. Our employees are instructed to use strict standards of care in handling the personal information of our clients, and the use of such information is dealt with in our internal code of conduct. Employees who do not conform to workouts.thebettyrocker.com and The Betty Rocker, Inc. confidentiality rules are subject to disciplinary sanctions which may include dismissal. 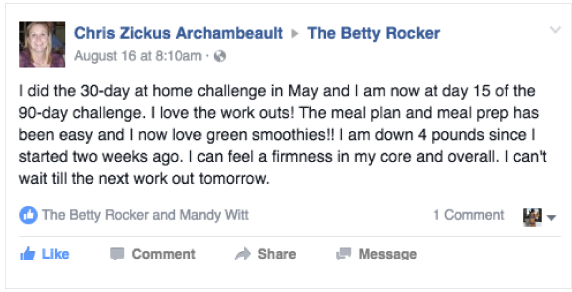 workouts.thebettyrocker.com and The Betty Rocker, Inc. does not transmit any personal information collected through its website to any third parties. Personal information may be transmitted, however, if there is a specific need to complete a transaction requested by the online user. Unauthorized downloading, re-transmission, storage in any medium, copying, redistribution, or republication for any purpose is strictly prohibited without the written permission of workouts.thebettyrocker.com and The Betty Rocker, Inc.. If you have any questions about the protection of personal information you have disclosed on workouts.thebettyrocker.com and The Betty Rocker, Inc.’s website or it’s terms and conditions of use, please send us an e-mail at support@thebettyrocker.com, so that we can address your questions as quickly and completely as possible. Copyright © 2016+ thebettyrocker.com and The Betty Rocker, Inc. All rights reserved.